The autor is Artemii Lebedev, one of the leading web-designers in Russia. He recently went on a trip to DPRK. You can read full story in Russian here :http://tema.ru/travel/choson-1/ I'll translate his comments briefly. On your arrival at the airport you need to leave your cellphone, no roaming service is avaliable but if you select an operator manually you get PRK 03 although I never saw a single person with a cell-phone. Laptops are allowed it seems that north koreans are not aware of cards that can make your laptop to work like a cellphone. About 5 (?) years ago, a western filmmaker was finally allowed into North Korea. Strangely, he was allowed to film and disseminate footage of the stuff we don't normally see (NOT like the "model house"). I didn't see the film, but I read a long review of it at the time ... sounded horribly depressing, just as you'd imagine. I'll try to find something more about it and post here. they look like giant tombstones on the grave of a godless civilization. It would appear that I was wrong about The Peoples' Really Swell Democratic Republic of Korea.It really *is* a workers' and peasants' paradise.These pictures prove this. That BBC "hidden camera" documentary I saw recently showing beggars on the streets,etc,must have been faked. "What emerges is a depressing picture that reinforces commonly held ideas of North Korea as a bleak, dirt-poor, Orwellian state." One of the creepy things I remember reading was that citizens are awakened every morning by loudspeakers in the streets telling them to get up and get to work. Cool pics. Some time back there was a thread about someone who took a ride through Chernobyl. The pics were almost as interesting as this. The pictures are so eerie. As I was viewing them I was thinking to myself how much I love America and how fortunate I really am to have the freedom I do. Good article. Thanks for post it. Wow, those are some great photos. 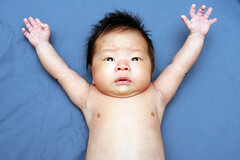 I found this baby picture of Kim Jong il towards the end. Obligatory satellite photo of North Korea vs. South Korea at night. Very interesting. Thanks for posting. What I notice first is the lack of actual people anywhere. The place seems almost deserted. What interesting pictures at the link...thanks for posting. if any of you want to read a very intersting book about a N Korean gov't women who was thrown into prison - she later escaped - this is her story: By Soon OK Lee, Eyes of the tailless animals. It will leave you changed. I knew N Korea leadership was wicked, but never on that level. BTTT for an old thread.